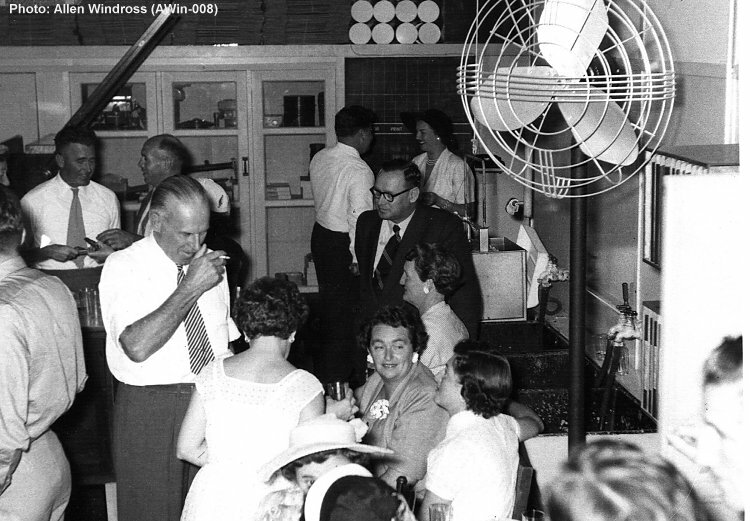 The 1955 Christmas party which was held in the Adastra photolab. Bunny Hammond is talking to the ladies, the one facing camera with flower in lapel is Joan Pearce from the drying section. Opposite her in front of Bunny is Rene Pearce (no relation) who was a good singer who entertained at Adastra functions. Behind Bunny is Jack McDonald about to become Chief Engineer (left) talking with Jack Howard (pilot). Chap to the right in dark suit and glasses is the Kodak rep and behind him is Kevin Murray talking with Judy Schneider.